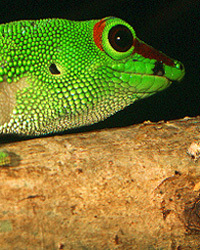 Phelsuma geckos are a perfect example of how Madagascar is different from other parts of the world. In most places, lizards in the gecko family are active at night. Phelsuma geckos are active in the day. Geckos from other areas for the most part have colors that blend in well with their surroundings. Phelsuma geckos are often blazingly bright colors, such as Phelsuma madagascariensis, photographed in the far north.